We spend the evening with preparing the ship as well as the dock with fenders etc. I woke up early and did som paperwork in the ship before I continued mounting the fenders, filling up water etc. I met Agnes sailing friend in the neighbour boat so I talked a bit with him as well. He had arrived from US with a broken foot. At approx 11 am we left the harbour in blue sky at approx 5ms wind from south. 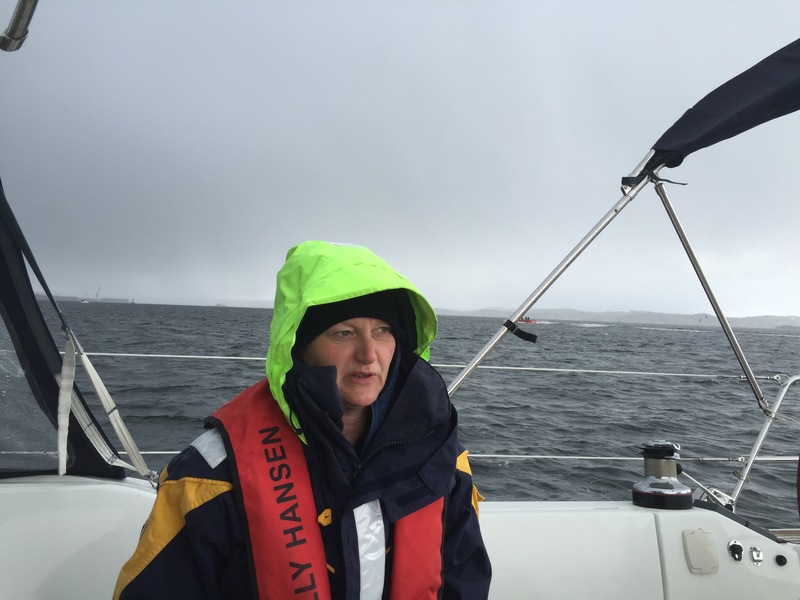 We took the course west of Hållö. We used the gennacker for the first time when crushing towards fallbacka. With the exception of some wild screaming from me due to wrongly implemented ropes everything worked out fine. In fjällbacka we found a nice spot to dock. Agnes and Seppe visited us for a while 😉 as they were on a coast tour with the car. After a slow start in the morning and in nice weather I went to the grossory shop to by more coffee to the ship. On my way back I run into Johan and Monica Bexell who I have not seen for a long time. Nice to see them. Me and Anna departed Fjällbacka after saying goodby to the boat docked closed to us. It was Dolphin from Bohus Malmön, a very nice new Grand Banks. We drove by engine (no wind) north via havstenssund towards koster. 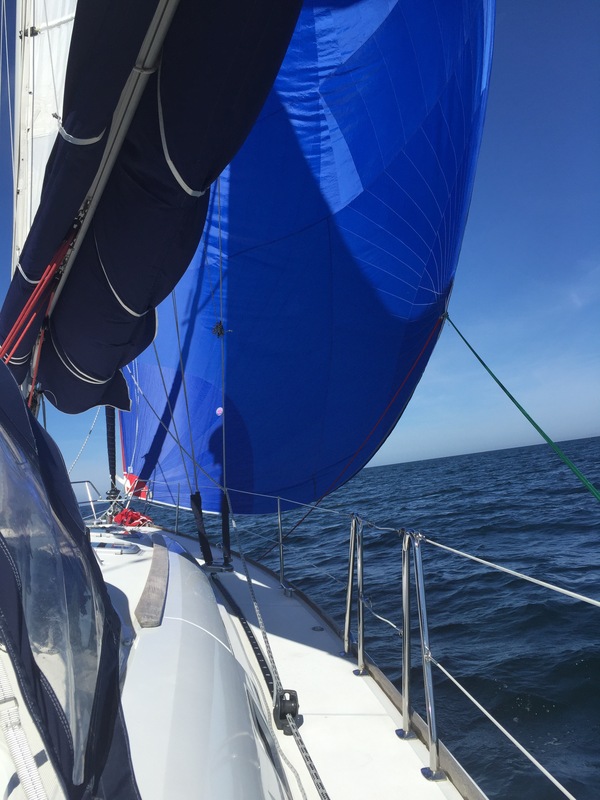 The last part we set the genua did it was not much wind. At Koster we had a reservation just after the line ferry. Great spot. In the afternoon we run into a former Volvo colleague Jörgen Karlsson and his norweigian wife. They had been sailing for a week and was on their way to Norway. In the evening we visited Stefan Gitje family restaurant Galejen. We had a good time together with Stefans family. Another beautiful day with blue sky. 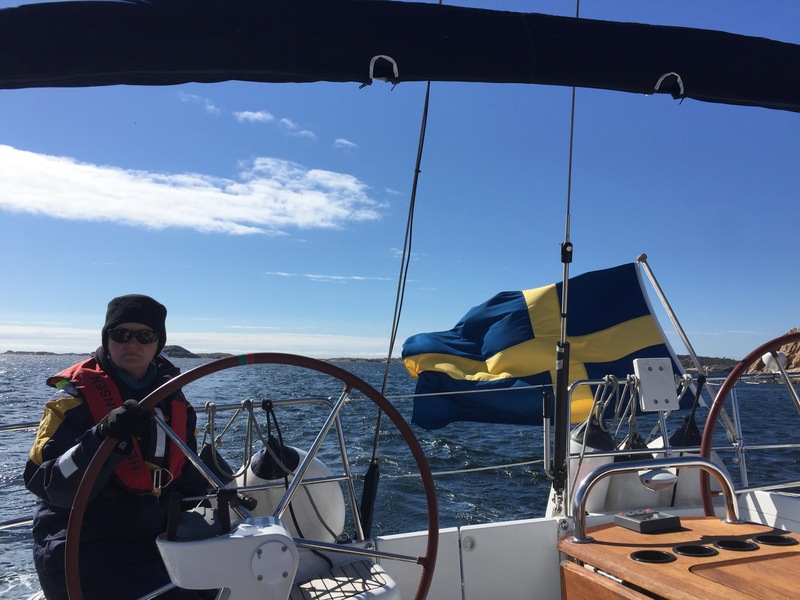 We departed approx 10 in the morning and went via Ekenäs towards west in kosterfjorden. 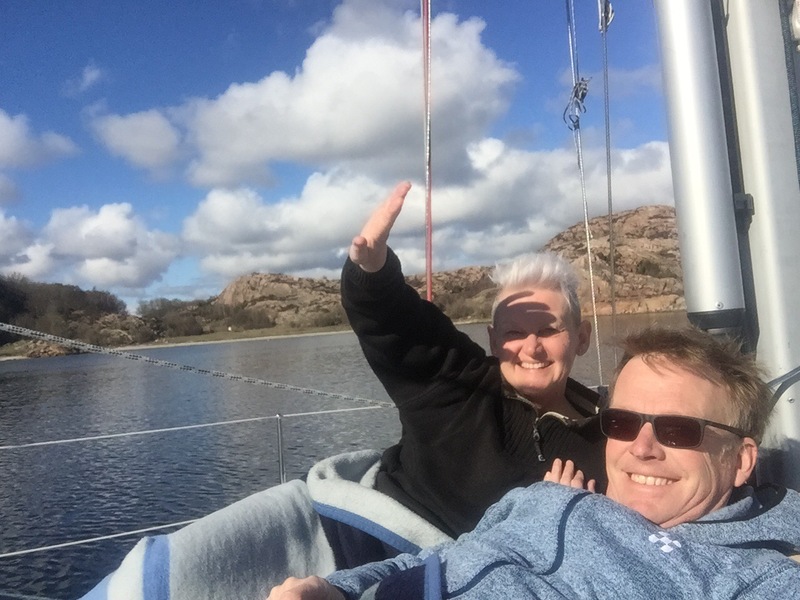 We choose to go off shore towards väderöarna. We had no wind so our Yanmar had to work. 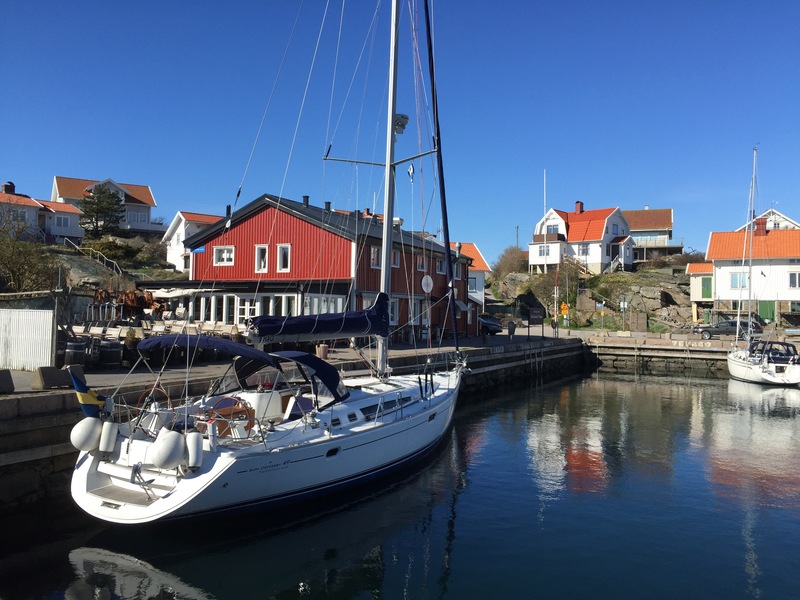 We did not stop at Väderöarna but we went close by the beautiful harbour. We thereafter went straightforward towards Bovalstrand and Valöbay. We found our neighbour from Basteviksholmen with the Deahler also in this bay playing with the kids on the beach. Anna and My self used our canoe and explored the area. As the sea was completely calm it was great to use the canoe. We was a way more than an hour crusing around islands. The rest of the evening was spend on the ship watching the sun set. As we had been in Oscars and Therese apartment celebrating Oscar turning 22 the 14th of April we were a bit late to the harbour and therefore stayed over night. The morning started with som work fixing the AIS antenna (took awhile to identify the correct cabel ;-)). After some hours we left the harbour in great weather, blue sky and 7-8 ms with wind from north. 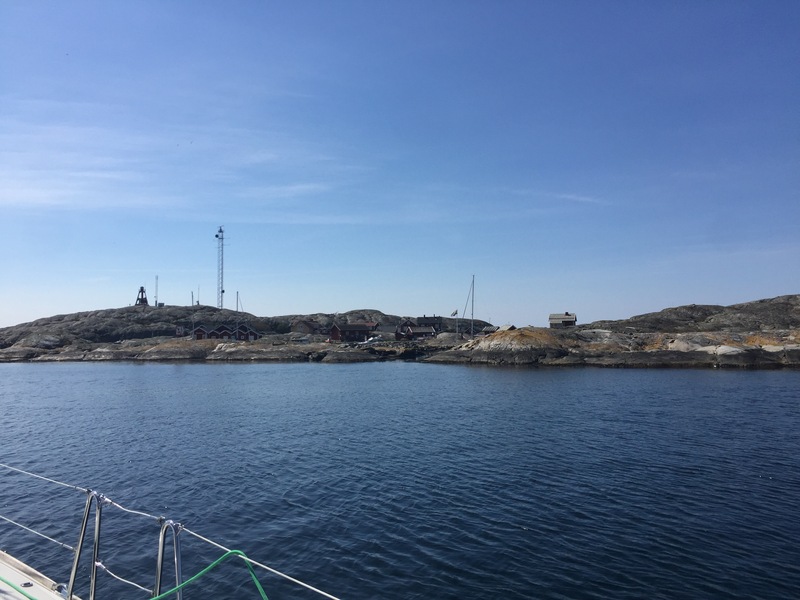 We set the sail and sailed south via gåsö channel towards gullholmen and straight to Mollosund. Very few boats in the harbour so we got a perfect spot. We relaxed a bit before we took a walk around Mollosund. Great day !! 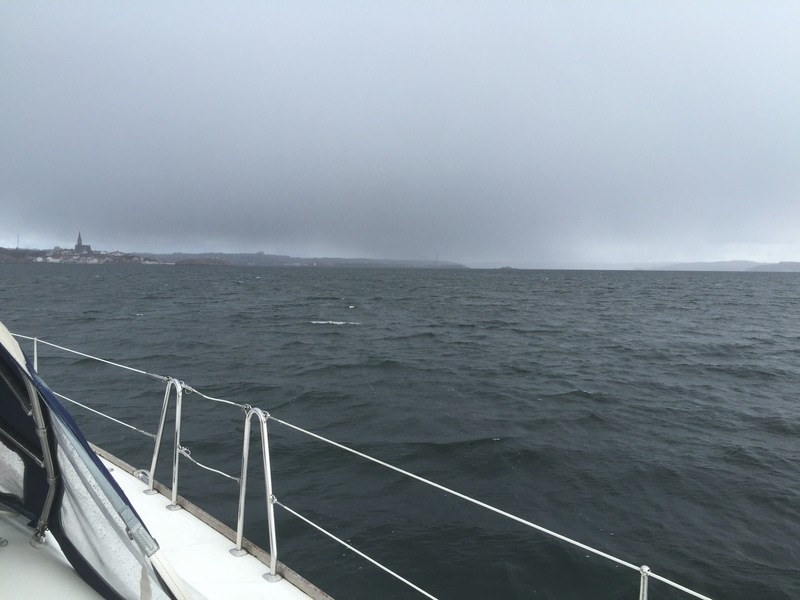 From yesterday with beautiful weather we got rain, snow on our way back to the harbour. Typical April weather. The wind varying from 3 to 9 ms from north east so we used the engine. When arriving to Bastevik the weather was cold and windy. We decided to stay in the harbour instead having a good dinner in the ship. I drive to Uddevalla to buy som cables in order to connect to the AIS. When I came back Anna was awake and we decided to depart towards Bovalstrand. 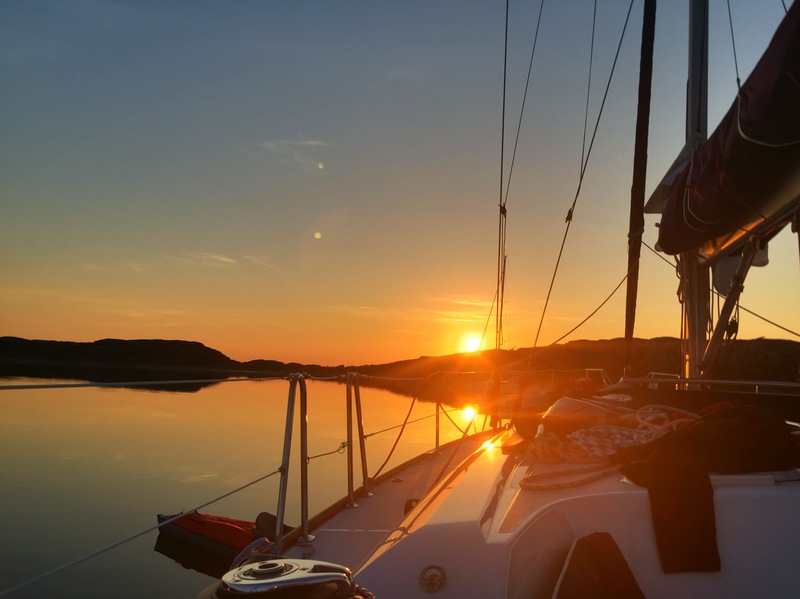 It was nice weather but no wind at all do drove off shore west of Smögen and straight to Bolvalstrand. When arriving we found a nice spot at the main pier . We stayed in the ship and relaxed during the evening. My aunt Ann-Britt came to the ship but we decided we should walk to her house instead. We had a very nice time together eating pancake and drinking coffee. It is hard to understand the is 80 years old. In the afternoon Anna and I went back to Basteviksholmen via Soten. The afternoon was very nice so we spend time on the deck with a glas of vine. Great !!! After a relaxing start of the day we start our trip back to the harbour. We then spend time to clean and wash the ship. 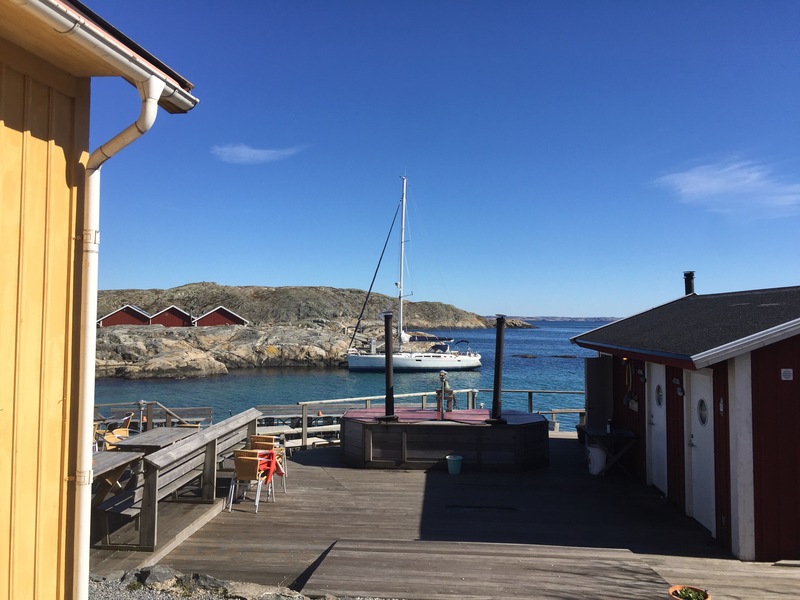 As Bo never been to Vaderoarna I really wanted to show him this fantastic place far west in the archipelago. We therefore set the course straight towards Vaderoarna but as we had the wind against us we used the engine. When coming closer to the islands we were able to sail which was great of course. We got our favourite docking position as it was no other boats on the island as it is off season. Good for us. We had a very good lunch (salmon) at the restaurant with a great view towards our ship before we took a walk on the island. We went to the view tower but also walk around the island following the outlined path. Good with exercising to loose weight, right Bo? Independently how beautiful Vaderoarna is we decided to leave for Fjallbacka and had a good sailing east into the harbour. The docking was a big hard as we needed to dock towards the wind. Eventually we succeeded and went to the bar to celebrate with a beer and small whiskey. Great. 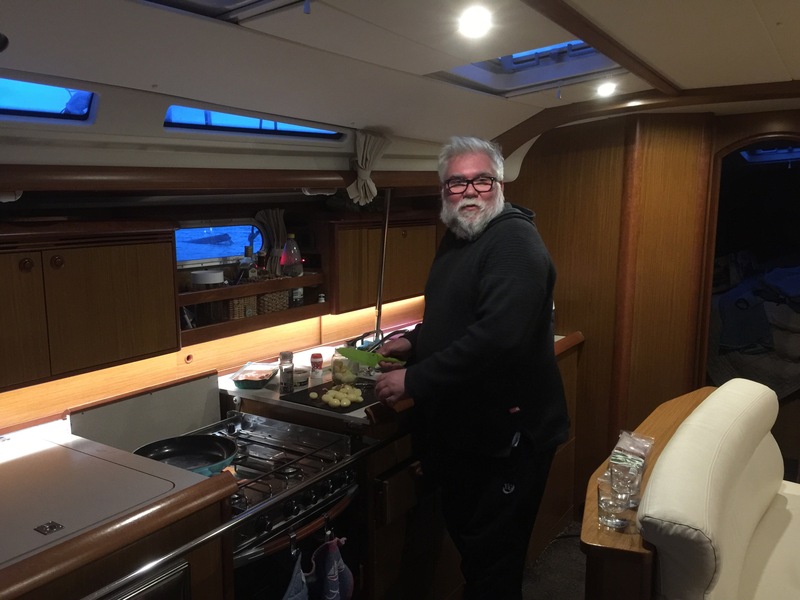 Evening was spend in the ship, making good food and having good talk. Weather not nice at all. Wind (8-12ms) from south and with a cloudy/rainy sky. It is going to be a cold day. 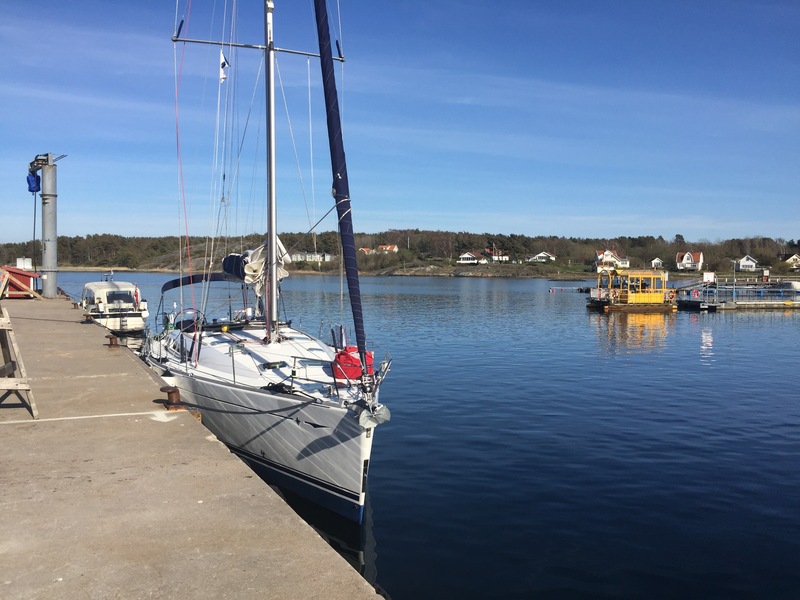 We used the Yanmar to drive us inshore via some again to Smögen (not many boats in the harbor) where we went to Göstas to buy a shrimp sandwich which we ate in the boat. After the lunch brake we went straight to our final destination Fiskebäckskil.